I was asked to review a product from a seller from Etsy! This is my very first review and I couldn’t be happier to review this adorable vegan hand made bag. Upon opening the package, my daughter, who will be three on Sunday, snatched it away and said, “My purse! Is this my birthday present?”She went off running with it..
Once she agreed to give it up, I asked Gia, my older daughter, what she thought of it. This bag has denim fabric on the top and bottom, and different vertical strips of multicolored fabric all around the bag. 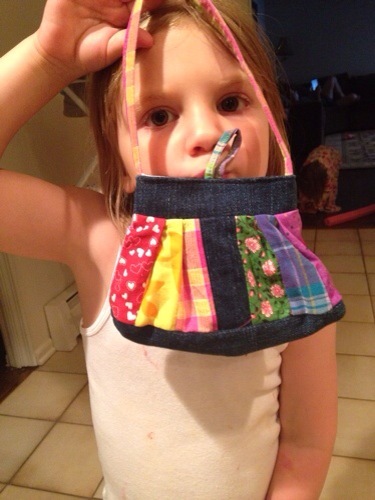 A simple, fabric strap makes the purse easy to hold. 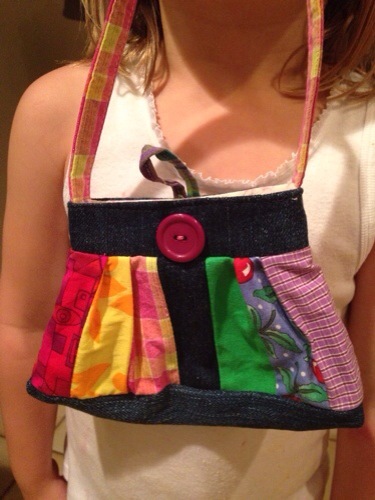 The purse has been hand sewn with repurposed fabrics from an original pattern designed by the seller. I love the hand made look of the bag and it’s truly something different than the usual merchandise that one finds in commercial stores. The purse would be perfect for your little girl(s) or to give as a unique and thoughtful gift. 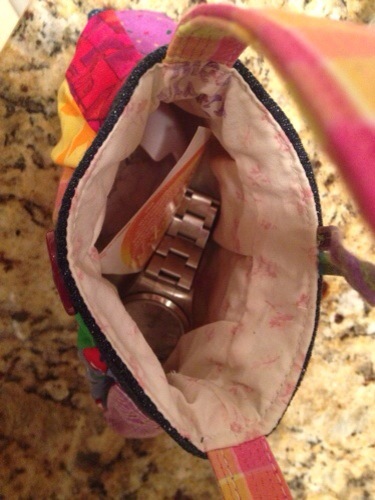 Arianna already put her “things” in…including Daddy’s watch and wedding ring! Megexpressions on Etsy. Her items are super cute and have a warm, happy feeling to them! GIVEAWAY OPPORTUNITY – ENTER TO WIN A BAG JUST LIKE THIS ONE! REPLY TO THIS POST TO ENTER FOR A FREE GIVE AWAY BAG FROM megexpressions on Etsy! JUST WRITE THE WORD “YES” in the comment section. MUST HAVE EMAIL entered as a follower of my blog. Locate the submit email form on the right sidebar or if your reading on your mobile device, scroll down to find the submit email section. I will pick a winner by a good old fashioned name drawing on August 20 th, 2014. Woo hoo! Hitting the big time Jilly!! Yes!!!! Love your posts. You are so creative.